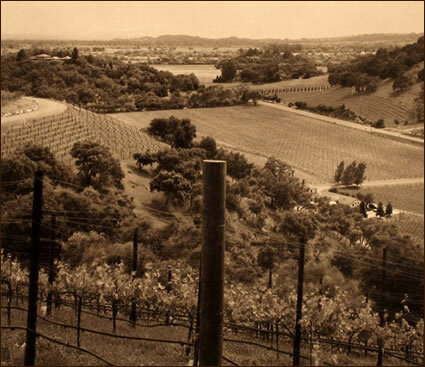 Named in honor of Greg and Carol Lindstrom's two daughters—Nicole and Ali—Nicali Vineyard reflects an intimate connection between the Lindstrom family and a remarkable piece of land in the heart of the Stags Leap District. While searching for a small vineyard to explore their love of wine and agriculture, the Lindstroms discovered a beautiful 20-acre hilltop property in Stags Leap. Though surrounded by revered vineyards owned by Stag's Leap Wine Cellars, Shafer Vineyards, and Joseph Phelps Vineyards, this idyllic site remained unplanted due to its steep hillsides and complex topography. The Lindstroms believed that if approached with patience and artistry, the land possessed all the qualities necessary to produce Cabernet Sauvignon of rare depth and power. To achieve this goal, Nicali Vineyard is a tapestry of 11 gem-sized vineyard blocks, each planted with clone and rootstock selections carefully chosen with an eye towards soil type and sun exposure. With plantings on both a narrow ridgeline and on the vineyard's lower sloping hillsides, the architecture of each block has been designed to flow with the natural contours of the land. As a result, grapes from certain blocks derive their elegance from cooler morning sun, while others develop more robust flavors from their westward facings. Nicali Vineyard has been planted to four separate Cabernet clones (337, 4, 7 and 6) on drought tolerant 110-R rootstock for the ridgeline blocks, and 101-14 for the hillside blocks. Though planted to only 4 total acres, Nicali's diversity of soil, sun exposure, clonal selection and rootstock yields a complex palette of fruit from which to craft the final blend each vintage. To maintain the vineyard's pristine integrity, Nicali is hand farmed by renowned vineyard manager, Michael Wolf, using earth-friendly sustainable techniques. Whether meticulously pruning to ensure low yields from beautifully balanced canopies, or weeding by hand, our dedicated Nicali team constantly strives to achieve the site's potential as a world-class vineyard.